When I read Rowan Strong’s book on Anglicanism and the British Empire recently, I found myself somewhat surprised that historians coming out of a different academic stream- in this case, the history of Christianity- were wading in the same waters that I splash around in through studying colonial communities through a transnational lens. There were similar questions and concerns, but when I checked the bibliography, I found that the author had drawn from a largely unfamiliar body of literature written by strangers (to me!). Why hadn’t I heard of any of these people before? This was not at all the case with this book, which felt very much like ‘home’ for me. Alan Lester and Fae Dussart have written a couple of papers together, and Alan Lester is perhaps best known for his concept of ‘imperial networks’ of people, goods and ideas- a concept that I’ve found really useful. Lester is a Professor of Historical Geography at the University of Sussex, where Dussart is a Visiting Research Fellow, lecturing in Modern British and Imperial History (originally from the University of North Carolina). Looking through their bibliography, I found very familiar names- Catherine Hall, Zoe Laidlaw, Antoinette Burton, Julie Evans etc. These are my people! 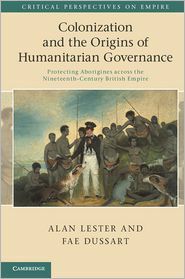 Their book explores the paradox that at the very time that the British Empire was embarking on its violent dispossession of indigenous land across multiple sites, it was also professing humanitarianism and a deep desire to ‘do the right thing’. Is it possible to reconcile two such disparate impulses? 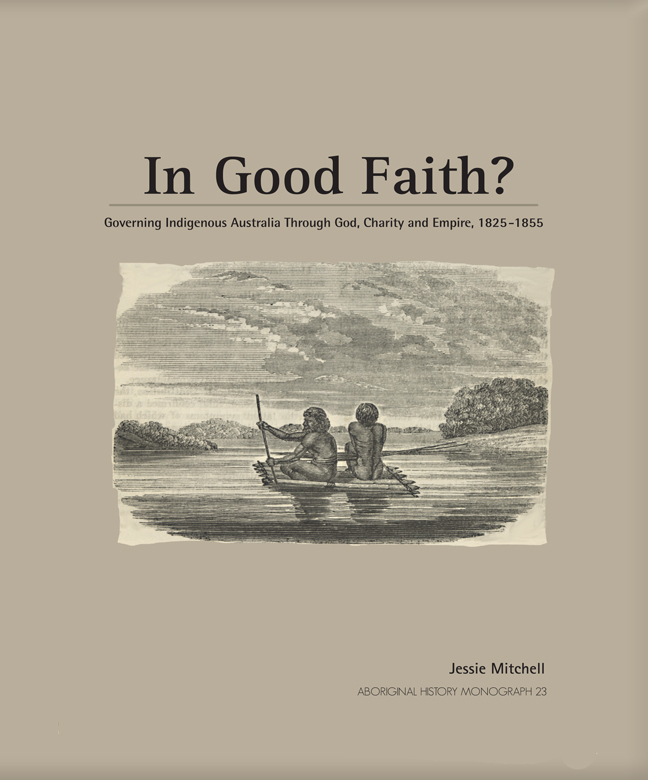 Lester and Dussart choose to use the term ‘humanitarian’, even though other historians have chosen other terms more commonly used at the time (for example, Jessie Mitchell’s In Good Faith? uses the term ‘philanthropy’) . But in the opening chapter of this book, it is clear that their observations extend beyond the 19th century settler colonies when they discuss present-day humanitarian campaigns and organizational structures. As in Strong’s book, they draw a longer timespan for humanitarianism than just the 19th century evangelical movement, while acknowledging its fundamental importance for the settler colonies under discussion They describe humanitarianism as a chain, with donor/philanthropist/recipient links, noting that it is always an unequal power relationship. Actors at each point perform roles for the benefit of those next along the chain with missionaries, protectors or aid workers on the ground always having to perform dual roles for the benefit of donors above them and recipients below them (p.11). The book combines biography and geography. Humanitarian governance during the 19th century was mediated through the men (for it was, in this case always men) who took it upon themselves to govern the empire. To get to know what feelings and behaviours, what affects and effects, a humanitarian moral code engenders, one has to try to understand these men at various levels of governmental structures as complex individuals with varying capacities in a world of dynamic social relations that they only partially comprehended and controlled, but sought to improve, in the process raising their self-esteem and the esteem in which they were held by others. The book emphasizes the importance of the sequential locations of its main ‘characters’, and by picking up on Doreen Massey’s idea of ‘place’ as the juxtaposition of intersecting trajectories, highlights the fact that these mobile men of empire encountered differentially contrived sets of relations between Britons and ‘others’ in the colonies they administered. It traces the genesis of humanitarian governance as it moved from the idea of ’emancipating’ and ‘ameliorating’ the conditions of slaves in the West Indies through to ‘conciliating’ ‘protecting’ , and attempting to ‘develop’ the indigenous peoples in the expanding British empire. It focusses in particular on the Protectorates established as secular schemes in the Cape, Port Phillip and New Zealand, and the experience of the men working, often for the very noblest of motives, in a program- for Port Phillip at least- that always had eventual assimilation and dispossession as its ultimate intention. The book opens with Sir George Arthur, whose career took him from Honduras, to Van Diemens Land, to Canada and then India and then closes with another George- Sir George Grey, who career traversed South Australia, New Zealand and the Cape Colony. Historians in these erstwhile colonies often have a very different ‘take’ on the slice of career spent in their homeland, and the nuanced approach in this book gives them a coherence not easily detected in colony-bound biographies. I really enjoyed this book, and not just because it is right in my area. Many of the chapters have been published in article-form in different journals, and I enjoyed having them integrated into a single text like this. It was easy to read, and the interweaving of observations about current-day humanitarianism was insightful. Once again, it’s damned expensive in both hard cover and even in e-book form ($65A), so it’s one for the academic libraries, I guess. A shame really, because I think its appeal could well stretch further than that. So what did I do on Australia Day? I received an award!! 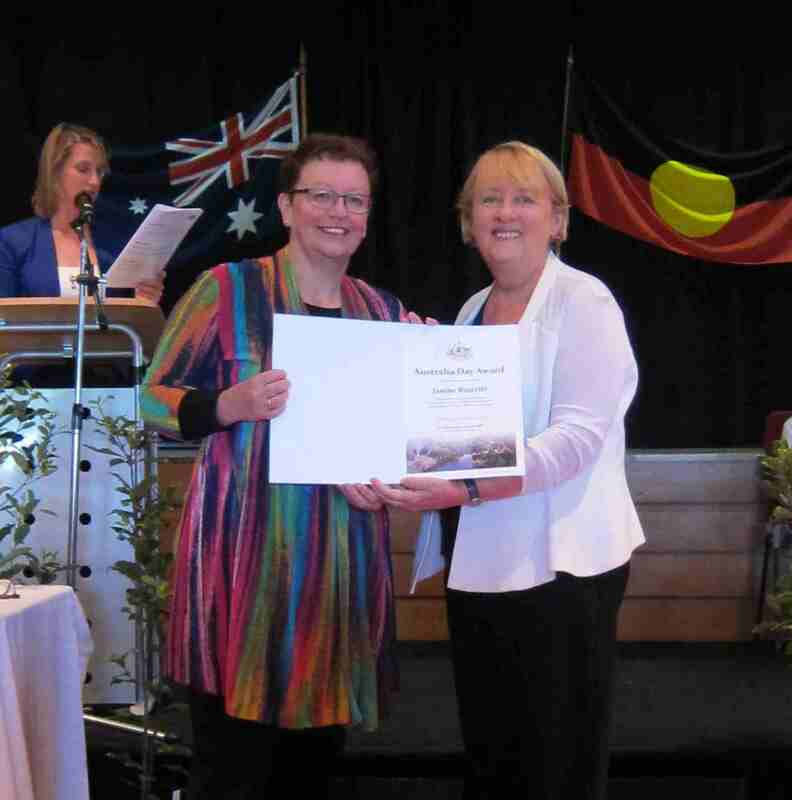 Not one of the big ones that they print in the paper, but a JagaJaga Community Australia Day Award for my work as Secretary of the Heidelberg Historical Society. I’m touched and unexpectedly chuffed! On my shelf there are two books that I have borrowed about William Lyon Mackenzie. I pick up the first one, The Firebrand and check out the publication date- 1956. I pick up the second one William Lyon Mackenzie: A Reinterpretation, thinking from the title that it would probably be the more recent book. Ah, but I’d be wrong. Although it was published in 1979 for the first time, the text itself was written seventy-one years earlier. And in this case, the story about this book and its troubled publication history is probably even more interesting for a 21st historian on the other side of the world, than the book itself. A household name in one country can be greeted with a quizzical “Who? ?” in another. William Lyon Mackenzie (1795-1861) is such a person. Newspaper editor, entrepreneur, and controversial politician, he was one of the leaders of the rather disorganized and immediately suppressed Upper Canada Rebellion of 1837 (although he escaped fairly lightly compared with the rebels he led, many of whom were transported to Australia as Tony Moore’s recent book- review here- explains). Particularly for Canadian schoolchildren, in a historiography that can seem (like Australia’s) rather, well, bland, the rebellion and William Lyon Mackenzie stand out as flashpoints, rather like Peter Lalor and the Eureka Stockade might stand out in Australia’s similarly ‘colourless’ schoolroom historiography. The first book about William Lyon Mackenzie was a two-volume ‘official’ biography written by his son-in-law Charles Lindsey and published within a year of Mackenzie’s death. As might be expected, it was a highly laudatory appraisal and set the scene for Mackenzie to be embraced as the Father of the Upper Canada Rebellion and Founding Figure of Canadian Democracy. When, in the early 1900s, Toronto publisher George Morang embarked on his multivolume biographical work ‘Makers of Canada Series’ to celebrate the makers of Canada’s national and independent history (with none of that servile backward-looking Colonial stuff) Mackenzie was a shoo-in. But William Dawson LeSueur was not originally approached to write the Mackenzie volume. Instead, as a recently-retired prolific essayist and historian, he was asked to review the Mackenzie biography that was originally commissioned for the Makers of Canada series. On LeSueur’s advice, the manuscript was rejected. Publisher George Morang asked LeSueur to take up the challenge, but he refused. It was only when the replacement biography fell through that LeSueur was contracted for the job, commencing in 1905 . LeSueur contacted Mackenzie’s son-in-law, Charles Lindsey (who had written the very first biography) and arranged to have access to the Mackenzie Papers in the Lindsey home- in fact, he was invited to stay at the house to work on them. LeSueur told Lindsey that he was writing the biography for the Makers of Canada series, but did not mention that he had been responsible for the rejection of the first manuscript. Some family members were concerned that LeSueur was rumoured to be ‘a Tory’ and were concerned that the new biography would tarnish the reputation of their much-lauded forebear. Most concerned of all was Mackenzie’s grandson and up-and-coming politician Dr William Lyon Mackenzie King who was at the time the Minister for Labour and would just happen to end up Prime Minister. Given the family’s misgivings, LeSueur offered to withdraw, but Morang encouraged him to keep writing. But having handed over the single longhand manuscript, Morang rejected it. LeSueur was keen to recover his manuscript and offered to return the $500 cash advance he had received during the two years it took him to write it. Morang refused his offer and insisted on keeping the manuscript. Charles Lindsey had died by this time, but his son asked LeSueur to return all the Mackenzie papers he had in his possession, which LeSueur did, but he refused to hand over his own notes. And so the matter headed into the courts. The first case involved LeSueur’s attempt to recover his manuscript from Morang. Morang’s lawyers argued that because he had purchased the manuscript, property had passed to him and he could use it or not as he pleased. The case finally ended up in the Supreme Court which found for LeSueur on the grounds that where the inducement to write a book was both pecuniary and reputational (because it was based on the prospect of publication), the mere payment of the money without publication could not convey a title to the possession of the work. An appeal was unsuccessful. So, after three and half years, LeSueur regained his manuscript. But then the Lindsey family sought an injunction to stop LeSueur using any of the family materials that they had made available to him, arguing that he had breached their confidence when they gave him access to the papers. There was much argument over the distinction between an ‘agreement’ and a ‘contract’ to write a fair and balanced biography. LeSueur was ordered to hand over any papers and any extracts or copies that he had made in his own notes. He was prevented from publishing or making public any information he had gleaned from those papers. That’s an interesting thought for a historian. How, having read something, do you then separate out one particular idea from the whole general picture that you’ve developed? In 1915 LeSueur rewrote the book, citing other readily available sources to support the same argument that he had mounted in the original book. He wrote a lengthy preface, putting his side of the controversy. This revised book and its preface, however, were never published- and remained unpublished until A. B. McKillop published Willian Lyon Mackenzie: A Re-interpretation in 1979 with his own foreword, LeSueur’s preface to the 1915 expurgated text and the original 1907 manuscript. As for the book itself? Yes, it certainly does challenge the Mackenzie-as-Hero characterization, and argues that the Canadian Rebellion would have occurred without him- and that, in fact, his actions cruelled it. I find it quite amazing that a family could have stopped publication of what, to me now, reads as a historical argument rather than a warts-and-all biography. I must confess that while I’m aware of the ‘fair dealing’ approach for research and study purposes here in Australia, I haven’t really thought (or been encouraged to think) about the legal ramifications of dealing with primary documents. Interesting, too, given that with the current push to have universities place theses online blurs the line between ‘research’ and ‘publication’ even more. Harvey, Cameron, and Linda Vincent. “MacKenzie and LeSueur: Historians’ Rights.” Manitoba. Law Journal 10 (1979): 281. Bilder, Mary Sarah. “The Shrinking Back: The Law of Biography.” Stanford Law Review (1991): 299-360. It’s never good when things go BANG at 7.00 a.m. on a drizzly, humid Saturday morning in January. Oh dear. Not good at all. Down came the pergola on the back deck, weighed down no doubt by about fifteen years’ growth of wisteria. I had noticed the previous day that it was very dark out there, and didn’t realize how thick the leaves had become on the top of the pergola. We used to prune it fairly hard to stop it getting up into the roof- but obviously not quite hard enough. My wisteria gave me much pleasure. Sure, it dropped blossom and covered the deck with its purple haze, but it smelled beautiful and the bees loved it. We spent all weekend pulling it down. The pergola had rotted underneath it- in fact, I suspect that the wisteria was holding up the pergola rather than the other way round. It looks very bare and glare-y out there. I’ve had to cover the fern with a sheet. I think I shall call it Miss Havisham. I used to love how green and cool it was under the pergola in summer looking out from the kitchen sink. Not quite the same now. My deck and the large sliding doors leading into the dining room face north, so I’m keen to have another pergola with a deciduous vine, to get the winter sun and shade in summer. I’m thinking an ornamental grape, hoping that it doesn’t have quite the voracious wandering habit of the wisteria. But, oh dear, I do grieve its loss. Yes, I know- first world problem. 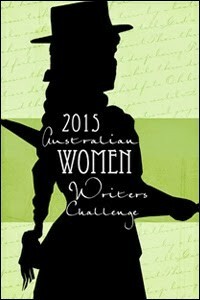 And so here I am again, signing up for the Australian Women Writers Challenge again for the third year. I’ll go for the Franklin again, and I’ll try a bit harder this year to concentrate on women historians. And just think of all the reading I can do after the thesis is finished!! 1825 to 1855- just thirty years. Thirty years to start off with a timorous hope that perhaps it might be possible to spread Civilization among the Aborigines and lead them to the Christian Religion, only to end with an acknowledgement that it hadn’t worked, and that the whole situation had to be turned over to God’s mercy and his wondrous ways. In 1825 L. E. Threlkeld established a mission at Lake Macquarie in NSW; in 1855 John Smithies closed his Methodist mission in Western Australia. These two events form the bookends for this analysis of Australia’s first missions and protectorate stations. Her work concentrates on Protestant missionaries working both on Church-based missions and government-sponsored Protectorate Stations. Although there was a high degree of cross-over, the distinction is important (and perhaps could have been emphasized even more strongly). 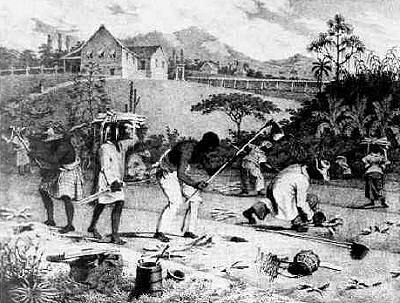 The interconnection between the church-directed missions and government-directed model was there from the start, when the idea of government-funded Protectorates was first recommended by a Select Committee with a strong representation of Evangelical Christians, several of whom had been involved in anti-slavery campaigns in the past. But the Port Phillip Protectorate was established and funded by government – not the churches. Protectors were expected to attach themselves to the tribes in the district and attend them until they could be induced to assume more settled habits; watch over the rights and interests of the natives and protect them from encroachment on their property and acts of injustice; instruct them in cultivation should they settle in one place; educate and instruct the children; learn their language; be accountable for provisions and clothing and obtain accurate numerical information about them. They were also were expected to instruct in ‘elements’ of the Christian religion, with the expectation that other specialized teachers would take over instruction in the knowledge and practice of Christianity. (Note 1) It was this emphasis on religion that distinguished church-based and government-based models, because in many other regards they were very similar. But of the Protector and his four assistants who were appointed, all but one were Evangelical Christians, and their own religious fundamentalist beliefs very much influenced their perception of their task and the Indigenous people under their charge. When the Protectorate all went pear-shaped, several of these Protectors sheeted home the blame partially to the secular nature of the government scheme. The book explores the many tensions that are implicit in this declaration of ‘rights’, so to speak, and the aspirations for a God-centric, settled, institutionalized mission. Philanthropists were aware of the cruel dispossession of indigenous peoples, but they were not necessarily opposed to colonialization itself. In their attempts to foster agricultural labour on their own reserves amongst the people in their charge, missionaries themselves encouraged them to move away from traditional land use- something that became of crucial importance in late 20th century court cases (Mabo and Wik). Those missionaries and protectors who expressed the strongest support for Indigenous land rights were those who were most opposed to an Indigenous presence in the cities. Her analysis of ‘charity’ is insightful. Missionaries and protectors saw the distribution of food, blankets and clothing as a form of recompense for the loss of land and livelihood, but it was conditional on the Aborigines remaining on the mission. The ‘settling’ of Indigenous peoples on a mission was seen by the government as a sign of success, but if it was done through the distribution of food, then the missionaries and protectors were accused of profligate generosity. The missionaries’ dilemma goes on today: there were many echoes of the current government’s attempts to break the concept of ‘sit-down’ money and achieve school attendance through punishing the parents. Perhaps the ultimate tension was in the religious missionary task itself. We are now more attuned to the deep significance of the afterlife for Indigenous people, and are aware of the sensitivity about the names and images of people who have died. For the missionaries, however, the afterlife and death was the major ‘hook’ to evangelize to their charges. Mitchell emphasizes what we would now call the ‘born-again’ aspect of these missionaries’ religion: the whole penitence, conversion, personal-relationship-with-God thing still being preached in evangelical super-churches today. They wanted Indigenous people to have the individualistic, personal conversion experience, but they also wanted their church pews to be full with people streaming into church each Sunday, even if they didn’t yet believe. They wanted individualism, but institutionalization as well. And so, Mitchell suggests, we need to read the missionaries’ declarations of failure and disappointment carefully. As born-again Evangelicals themselves, they were much given to self-examination and confession of weakness, and this was a trope that played out well in the metropolitan churches and missionary societies as well. The Colonial Office, ever keen to reduce expenditure, took up these expressions of failure with alacrity, arguing that the whole project was futile and best ended. While it is wonderful that this book is available as an e-book, I found myself wishing that it had a few more book-like features. I read it in hard copy, and I missed an index in particular, and for some reason that I can’t quite fathom, I found the absence of chapter numbers frustrating. It is not difficult to read, but you’re still aware that the thesis is not far distant. I liked the way that the chapters started off with an anecdote or episode, and the logic of the argument was clearly laid out in the chapter structure. Conceptually, it’s a complete, well-managed project. As a narrative, the thirty-year time span gives a coherence and almost elegiac quality to this humanitarian experiment that was tried and found wanting.